Conservatives claim that President Obama “tripled the deficit” and point to the huge 2009 budget deficit as proof. They use charts that show the fiscal-year 2009 deficit, as reported in October was, indeed, about triple the prior year’s borrowing. But the 2009 budget was the last budget year of the prior, conservative administration. It is just one more demonstration of the failure of conservative policies. Basic math: A budget year that ends 9 months into a President’s first year wasn’t that President’s budget. 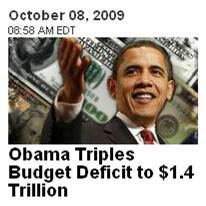 Listening to a talk radio program yesterday, the host asserted that Obama tripled the budget deficit in his first year. This assertion is understandable, since the deficit jumped from about $450 billion in 2008 to $1.4 trillion in 2009. As this chart illustrates, with the Bush years in green, it appears as if Obama’s policies have led to an explosion of debt.
. . . But there is one rather important detail that makes a big difference. The chart is based on the assumption that the current administration should be blamed for the 2009 fiscal year. While this makes sense to a casual observer, it is largely untrue. The 2009 fiscal year began October 1, 2008, nearly four months before Obama took office. The budget for the entire fiscal year was largely set in place while Bush was in the White House. What about the so-called stimulus, they will ask, with its $787 billion price tag? Or the omnibus fiscal-year 2009 appropriations bill? And how about Cash for Clunkers and Obama’s expansion of the children’s health insurance program? Didn’t these all boost spending in 2009? The answer is yes. But these boondoggles amounted to just a tiny percentage of FY2009 spending — about $140 billion out of a $3.5 trillion budget — as the pie chart nearby illustrates. Here are some examples of how this propaganda is applied. Keep in mind as you read these and look at the charts that the 2009 budget was Bush’s last budget, and began before Obama even took office. Heritage Foundation: Bush Deficit vs. Obama Deficit in Pictures. Look at how the colors on the chart trick you into thinking that 2009 is an Obama budget year. This is just outright deceit. Here is Heritage directly labeling the 2009 budget as Obama’s in a chart. Here is a similar use of deception in charts, by right-wing blogs. The right’s noise maching is good, though, there are 27,000 websites listed if you search for “obama tripled the deficit” in quotes. Conservative policies since Reagan have led to massive debt. Don’t let them trick you by changing the colors on a chart.